Cooking for Copyright is tomorrow, Friday 31st July. This is being held to gain support for copyright reform, so that unpublished works are treated the same way as published ones. Currently under Australian law, while copyright is limited to 70 years after the death of the creator for published works, for unpublished works copyright lasts forever, meaning these items cannot legally be digitised and made accessible to the community, family historians, researchers, and others who would find them a useful and fascinating resource. 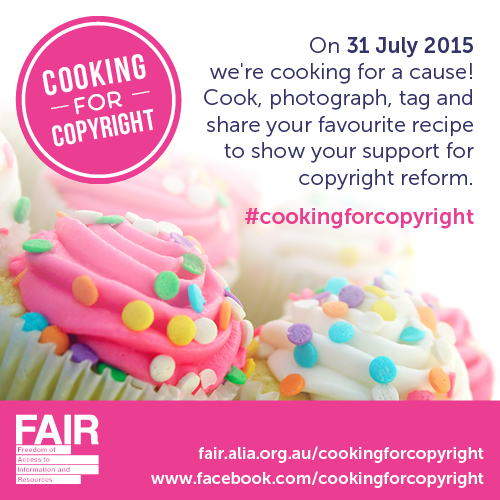 Why not cook one of the vintage recipes, photograph the result and share the photo on Facebook or Twitter this Friday, July 31 using the hashtag #CookingforCopyright. More information and some great recipes are available on the FAIR Cooking for Copyright webpage. We love reading...staff picks for July. Did you miss the headline when...?